Because we all know that dressing up always enhances your experience. And by that I mean it’s a good time to drop everything and start buying movie tickets, because like, all of my most anticipated movies of the year are coming out essentially back-to-back within the next month. Fantastic Beasts! Moana! Rogue One! What a lineup. My geeky heart can hardly take it. Of course it’s going to be exciting enough just watching these films in theaters, but if you’re looking for a little something extra (sartorially speaking, of course), to make your moviegoing experience really satisfying, this article is for you. Remember how exciting it used to be to dress up in your wizard robes and plastic wand for Harry Potter release parties? Well, who says that has to stop just because you’re “grown up”? Just see these movies as an opportunity to dress up and re-release your inner child. If you’re reading this post and haven’t seen Fantastic Beasts and Where to Find Them yet, UM IT’S BEEN OUT FOR A WHOLE DAY WHAT ARE YOU DOING?? 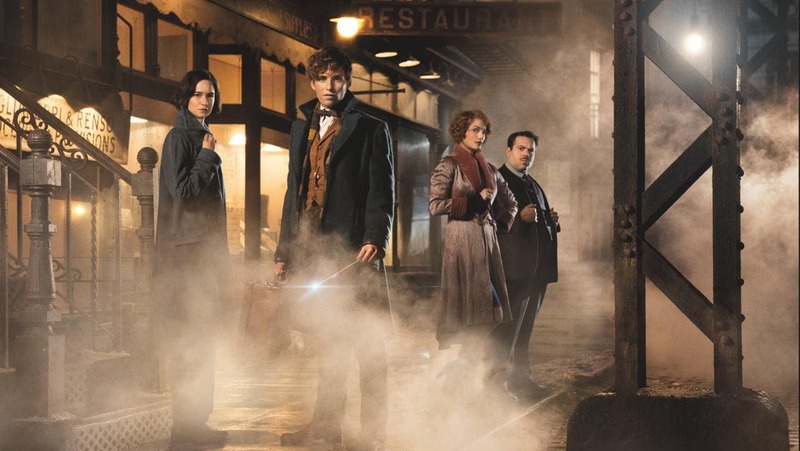 Fantastic Beasts is a spinoff of the Harry Potter Universe set in the American wizarding world of the 1920s. I’m so excited to find out more about the wizarding culture outside of the characters we already know and love! For a ’20s-esque look inspired by some of the characters we’ve seen in the trailers, pair a sensible white blouse with a midi skirt like this ethereal pleated grey one. ’20s-inspired accessories are a must, so enhance your look with black T-strap heels, gold art deco earrings (if this pair doesn’t scream “Gatsby” to you, I don’t know what will), and a pop of flapper-worthy glitter in the form of this stunning rose gold clutch. Don’t forget a coat (since everyone knows that you’re not a real geek hero unless you’re wearing a trench coat). I chose this gorgeous cranberry color because it’s a nod to the house colors of Ilvermorny, the American wizarding school. 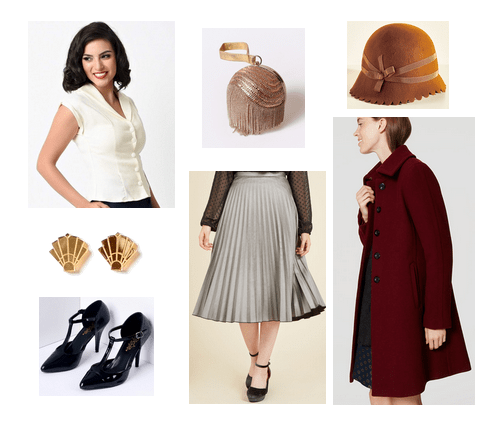 Finish off the look with an elegant cloche hat, grab your wand, and you’re ready to go! Moana is Disney’s newest animated movie, set for release next week on November 23. It follows the story of a young princess destined to save her village by venturing out on a grand journey with a legendary demigod. More importantly, the movie features songs composed by Lin Manuel Miranda (you know, Hamilton). For a look that will match the heroine of the film (without looking completely costume-y), pair a floaty coral blouse with distressed white jeans, then slip on some beachy wedges with a colorful geometric zig-zag pattern. The ocean is not only the setting of this film, it’s also a character in itself, so make sure you reference it properly with some sparkly ocean-blue studs and a shell necklace. (This one looks nearly identical to Moana’s!) Finally, run some surf infusion spray through your hair to get Disney princess-worthy beach waves. Thanks for the Christmas present, Disney. This movie (the first of the Star Wars extended universe anthology, which will also include a Han Solo backstory film!) is just about the only thing exciting enough to tide everyone over until the eighth Star Wars installment next year. Rogue One takes place in the time frame between Episodes III and IV and focuses on the mission to steal the Death Star plans. I’m not even going to lie to you, I got super overwhelmed on this one because I found too many Star Wars things I liked and gave up on trying to fit them into a cohesive outfit because I would have had to drop too many conflicting patterns. Yikes. So instead here’s just all of my favorite Star Wars-inspired pieces I could find. Wear one or two as statement pieces against more neutral articles of clothing, or just go crazy and wear all of them at once. Live your life. My personal favorites are definitely the Darth Vader dress (anybody else scream when they saw him in the trailer?) and the “Imperial Starfleet” and “Red Leader” pins (you better believe I already bought some). Will you be stepping out in style to attend any of these movies this season? Which one are you most excited for? Let me know in the comments!